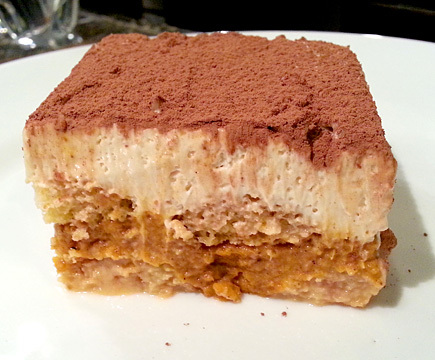 Pumpkin Caramel Tiramisu | Have YOU Ben Starr Struck? Tiramisu is Italian for “Hey you, pick me up!” Traditionally it’s a layered dessert of tiny cakes called ladyfingers soaked in espresso, and mascarpone (an Italian cream cheese pronounced “MOSS-car-PONE-eh” and NO OTHER WAY). You know me, and I find a way to put pumpkin in everything, so this is my VERY special version of tiramisu. I’m not sure what Joe Bastianich would think of it, but I like to think that, if no cameras were on him, he’d eat a whole tray. Dust the sugar generously onto the tops of the ladyfingers using a sieve or strainer. Immediately place the ladyfingers onto the middle rack of a preheated 400F oven and bake for 8 minutes. Remove from the oven, and immediately but gently pull the parchment sheet from the hot baking pan and onto a cooling rack, so that the ladyfingers don’t continue cooking from the residual heat of the pan. Let them cool fully, at least 20 minutes, before gently peeling them off the parchment. Add the spices to the bowl and beat until smooth. Beat slowly to bring it together, then beat on high until light and fluffy. You may wish to add additional sugar, but I don’t like my tiramisu too sweet. Take a 9×13 pan and lightly butter it. Arrange a layer of ladyfingers on the bottom of the pan. You may have to cut ladyfingers to fit around the edges…you want a fairly uniform layer. Pour the maple caramel evenly over the ladyfingers and allow them to sit for 10 minutes to absorb the caramel, occasionally flipping them over to ensure they get soaked on all sides. Gently spread the pumpkin mousse on top of the caramel-coated ladyfingers. Spread another layer of ladyfingers on top of the pumpkin mousse. Then gently drizzle the espresso mixture onto the ladyfingers. You don’t want them to get so saturated they become mush. So exercise restraint. It’s good to still see a few spots of un-saturated ladyfinger here and there. Top with the mascarpone mixture, then optionally dust cocoa powder on top. Cover with plastic wrap and chill in the refrigerator for 8-24 hours. Remove from the fridge for 30 minutes to an hour before serving…tiramisu should never be served cold. This entry was posted in Desserts, Recipes and tagged caramel, ladyfingers, pumpkin, tiramisu. Bookmark the permalink. Thanks you so much for this amazing recipe! I’ m from Italy and we really lovee Tiramisu’ and this new interpretation perfect,too! (or also better). Caramel and pumpkin make a fantastic and special flavour to the tiramisu’…I made it For my family and everybody loved it! Really a great recipe! Thanks you! Tiramisù is my favorite dessert… Now I want so badly to try this, Ben. I blame you for making me crave this like a pregnant lady! Sounds stupid but…how do I get the espresso??? ?